Adam and I are gearing up for the week we look forward to all year! We'll be headed to Burton, Texas to be counselors at Camp Periwinkle! Camp Periwinkle is truly a magical place where children with cancer and their siblings can get away from it all and have a total blast! Although we'll be exhausted, Adam and I will walk away from the week feeling rejuvenated, grateful, and full of perspective. The campers are truly an inspiration, and we all have so much to learn from them! Adam went to Camp Periwinkle as a camper when he was undergoing treatment. He definitely represents a light at the end of the tunnel for all of the kids at camp. I love to watch him interact with his campers, it's a tiny glimpse into what an amazing father he'll be! Also, I started my training schedule this week for our race in October. If you're interested in a program that has runs planned 3 days a week, check out my plan below! I'm excited to have a running plan that has 3 days of running per week rather than 4. Once school starts it will be difficult to keep up with training. Also, did I mention that the Chosen Marathon for adoption has a kids fun run?!? It's a 1/3 mile run for kids 11 and under! It's a neat way to get the whole family involved! Adam has been waking up three mornings a week just before five in the morning to go on his training runs. His commitment is such an inspiration. Every step forward is one step closer to our dream of becoming parents. We turned in all of our paperwork for our home study. The process will take around two months to complete. This is discouraging because our original goal was to have the home study done before school starts, but I know these things take time. Plus, we're hoping to fly to Jamaica and turn in our dossier, so having more time to plan/prepare for that will most likely be a good thing. Continue to pray for us as we move forward in this process. Also, pray for our week at camp and all of our sweet campers! 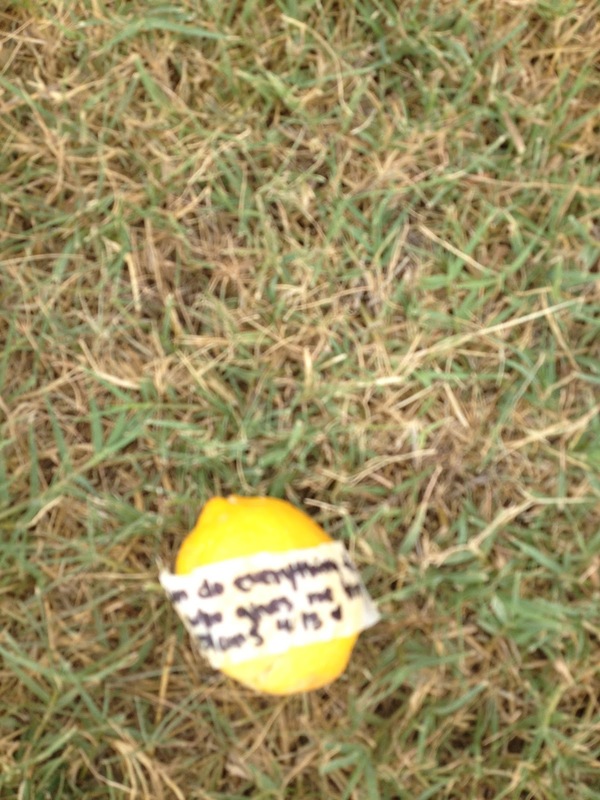 On a particularly discouraging and exhausting run the other day I spotted something bright in the distance. I was panting, sweating, and had just come up with several legitimate reasons why I should research more stationary ways to entertain myself. Curiosity got the best of me and I ventured off the trail to investigate this seemingly glowing object. 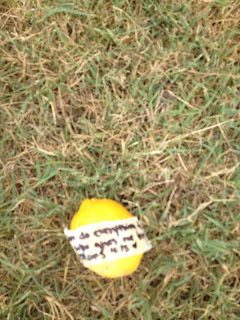 It was then that I encountered this random lemon in the grass with Phillipians 4:13 written on a piece of masking tape. "I can do all things through Christ who strengthens me." God works in mysterious ways. It was exactly the motivation I needed. I jogged back to the trail and felt refreshed and ready to finish my run. Proud of you both! Camp will be amazing. Can't wait to hear the stories!